Like the pancake breakfast in “Anchorman” (except we do it every year) – it’s time for our annual, year-end countdown of the Flaherty & Collins Properties Top Moments of the year! Our team enjoys this little countdown immensely, and this year is especially fun, as our recent office move has overlooking the festive downtown Indianapolis atmosphere. We hope you’ll join us on Facebook and Twitter as well, throughout the day (and late into the night), as we rock this countdown like Ryan Seacrest in Times Square. We snagged 24 awards in 2016, leading off with the Capstone Award by the Kansas City Business Journal for The Best Mixed-Use Project for The Heights Linden Square in Gladstone, Missouri. We collected awards from the Apartment Association of Kansas City (AAKC), the Apartment Association of Southern Indiana (AASI), the Apartment Association of Fort Wayne (AAFW) and the Indiana Apartment Association (IAA), where we collected nine (9) awards in October. Those included Best Floorplan (800 sq ft., 11+ years ) for Country Club, Best Floorplan (1100 sq. ft., 1-10 years ) for Millikan on Mass, Best Clubhouse (1-10 Years) for Axis, Best Company Wide Employee Relations Program for F&C, Best Overall Amenities for Flats at 146, Best Use of Technology for The Depot at Nickel Plate, Best Overall Corporate Marketing Program for F&C and Rick Stapp Regional Property Manager of the Year for Teri Hedemark. It marked the third consecutive year Flaherty & Collins Properties was honored with more awards than any other company at the annual Midwest Prodigy & Indiana Apartment Association (IAA) Awards of Excellence. Since 2014, Flaherty & Collins Properties has been honored with 27 awards (8 in 2014, 11 in 2015 and 9 in 2016). In addition, we also won the NAIOP Award for Best Mixed-Use Development for Axis! To quote Frank Sinatra, it was a very good year! 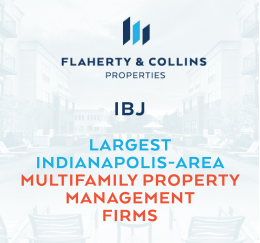 We were super excited this year to reclaim a spot a the top of the Largest Indianapolis-Area Multifamily Property Management Firms as compiled by the IBJ! Congrats to our outstanding property management team on this accomplishment! In November, F&C officially opened Historic Whitlock Place, an adaptive reuse development that creates 56 apartment homes in the historic Culver Union Hospital in downtown Crawfordsville. Flaherty & Collins Properties and the Evansville Housing Authority (EHA) broke ground in June on two Rental Assistance Demonstration (RAD) projects, located in Evansville, which provide public housing for seniors. EHA will use low-income tax credits awarded for HUD’s RAD, along with funds from private investors, to repair 888 units of assisted housing upon completion of phase 1 and 2 properties. RAD Phase 1 consists of Buckner Tower, Kennedy Tower, Schnute Apartments, White Oak Manor, and Caldwell Homes. RAD Phase 2 will include Fulton Square & Scattered Sites. The projects are the first in the state of Indiana utilizing RAD alongside the FHA 221(d)4 program. RADs allow Public Housing Authority’s (PHAs) and owners of HUD-assisted housing to preserve and improve affordable housing units that could be subject to vouchers and demolition. Flaherty & Collins Properties and Port KC kicked off the construction of Union | Berkley Riverfront Park, a mixed-use development along the Missouri River just blocks north of Downtown Kansas City, with a ground breaking ceremony in late November. As you can gather, we turned quite a bit of dirt over this year, breaking ground on several new projects. In October, it was 306 Riverfront District’s time to shine, as Flaherty & Collins Properties announced the groundbreaking of the $32-million mixed-use development of the former Apperson Brothers factory and surrounding property into a luxury apartment community. “We believe this project will add quality housing that supports the growing Kokomo community. This project is a major component of the continual revival of downtown. We want people to Live, Work and Play in downtown Kokomo,” said Austin Carmony, Vice President of Development for Flaherty & Collins Properties. With 198 luxury apartment homes and 4,800 square feet of retail space, 306 Riverfront District is set to open in the Winter of 2018. Over the years, Flaherty & Collins Properties has expanded it’s development and management footprint across the nation, but this was a first we were especially stoked about – not one, but two projects announced in Washington, D.C. as part of Mayor Bowser’s DC Housing Preservation Strikeforce. “We are thrilled to work with the Mayor and the City on these tremendous and impactful projects to preserve affordable housing across Washington, DC,” said Duane Miller, Vice President of Community & Asset Management for Flaherty & Collins Properties. What is the phrase? Out with the old and in with the new? Well, not quite yet. With all the new projects taking off in 2016, we cannot forget the projects we kicked off in 2015 that neared or reached completion – especially not one as transformative as 2700 University. Just a couple weeks ago, the F&C team descended on Saint Paul, Minnesota to cut the ribbon and unveil the $54 million mixed-use, transit-oriented luxury residential apartment development near the Green Line Westgate Light Rail Transit station. Project partners include the Housing and Redevelopment Authority of the City of Saint Paul, the Metropolitan Council, Local Initiatives Support Corporation (LISC – Twin Cities), BMO Harris Bank, and the National Equity Fund, Inc. (NEF). UrbanWorks served as the project architect, with Kraus-Anderson as the General Contractor. Landform was the project engineer. 2700 University will be a LEED certified community. We couldn’t agree more! Welcome to the F&C stable, 2700 University! Mr. Miller had a good year, as you might already be able to deduce from all the projects the Affordable Development Team worked on bringing to fruition in 2016, but it was quite the moment when he and the truly cool Historic Greensburg Square project were featured as the cover story of AHF in January. You take a good picture, Duane! In May, The Heights Linden Square was awarded two “green globes” by the Green Building Initiative®, denoting that the project demonstrates excellent progress in the reduction of environmental impacts and use of environmental efficiency practices. The Green Building Initiative’s® (GBI) Guiding Principles Compliance (GPC) is based on a site visit and detailed documentation review. A GBI-appointed third-party assessor verifies compliance and awards a Compliance Score and Rating. The Green Building Initiative’s® (GBI) Guiding Principles Compliance (GPC) programs are the first independent assessment and rating programs enabling government agencies to determine levels of compliance with the Guiding Principles, resulting from Executive Order 13514. By assembling the myriad of federal compliance requirements into one program, GPC facilitates the process to improve the sustainability of federally owned, leased or operated buildings. GPC sets the standard for accuracy, consistency, and credibility through a clear and simple yet robust third-party evaluation process. Our streamlined process and third-party assessors minimizes agency personnel’s time and effort to determine the level of compliance with the Guiding Principles. In addition to recommending improvements prior to construction, assessors provide you with a final assessment at project completion. Hundreds of federal buildings have been assessed using the GBI GPC programs, and now many public and private buildings are set to evaluate. We were honored to receive the Green Globe Awards, as F&C has been working hard on making our projects as green and innovative as possible. We’ll certainly continue that mission in 2017 as well! It was event years in the making, but we pulled it off, and rallied together nearly 2/3rds of Flaherty & Collins Properties 450-plus employees to the JW Marriott in Downtown Indianapolis for our 2016 Company Wide Event in late September. The theme – One Team, One Dream – could not have been more appropriate. At F&C, we are everywhere, as our Development, Construction and Management teams not only work on building affordable and market rate multifamily housing across the country, but also work on building strong communities where we live, work and play. The company -wide event was a chance for us to invest in building ourselves and uniting our team to celebrate, well, us. Our hard work and efforts, our accomplishments, and to come together under not just a slogan or mantra, but a goal. We were very honored and pleased to have given back to the community during this time, building 40 bikes and donating them to three local charities. It was not only a team-building exercise, but one that did some good. Jerry Collins, CPM, president of Flaherty & Collins Properties, a full-service multifamily development, construction and property management company based in Indianapolis, Indiana, was honored in October with the 2016 J. Wallace Paletou Award by the Institute of Real Estate Management (IREM) Foundation. The J. Wallace Paletou Award, a national honor, was presented to Collins for his outstanding contributions to the real estate management industry and his extraordinary dedication to the profession. Collins achieved this IREM Foundation Award because he demonstrated leadership and professionalism that impacted his community through many channels and actions. The J. Wallace Paletou Award is an IREM Foundation award conferred upon an individual who has made significant contributions to the real estate management industry or contributed to the betterment of society as a whole through the role of a real estate manager. And we’re very proud of the tremendous leadership we have in you, Jerry! Way to go! Don’t get us wrong, we liked the old homestead on the North side of Indianapolis (and its quick access to the Apple Store for all our tech lovers). But it was time for us to get some new digs. Just 10 days ago, we packed up and headed downtown to our new corporate headquarters on the 30th floor (and part of the 29th) of Regions Tower (One Indiana Square). Organized chaos is a good phrase, so we’ll go with that. In reality, it was the result of a lot of hard work and leadership across the company, as we wanted to make sure we got it right. The space is modern and contemporary, meant to encourage interaction, and intermixed with treadmill desks, a Golden Tee golf arcade game and a pool table to help employees blow off steam don’t hurt the cause. The space is also a tech upgrade, with interactive screens and spaces and multiple conference rooms with a variety of uses. “Office space is not about the space and how people use it, it is about how can a space support a company’s culture and the people that bring it to life,” says Keith Cole, principal with Mitsch Design. Cole sees Flaherty & Collins Properties as ahead of the curve with its buildout, a reflection of the company’s culture and what modern employees are looking for. Well said. And we’re certainly excited for a new year in our new space and to see what lies ahead for Flaherty & Collins Properties in 2017. With that, we end our countdown, and hope that you had a great 2016. From all of us at Flaherty & Collins Properties, we wish you, your families and friends, our partners and team members a very safe, prosperous and joyous New Year!